AUSTRALIAN captain Caitlin Bassett says the Diamonds have been "itching" to get back on the court to avenge their last-up loss to netball foes New Zealand and won't be wasting the opportunity now it's arrived. The Diamonds on Thursday start their quest to cleansweep their last international series of the year with a new "fire in the belly" following their 10-goal loss at the hands of the Silver Ferns last month. 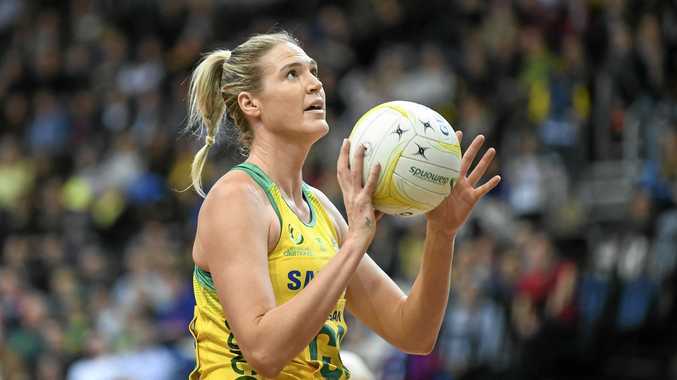 Ahead of her 70th game for Australia, Bassett said the opening match of the Constellation Cup in Auckland is about restoring pride and showing the netball world the Diamonds are worthy of their No.1 status in the world. "We didn't perform the way we know we can in the last game," Bassett said of the 57-47 loss in Invercargill coach Lisa Alexander described as "simply unacceptable". "I have spent the last four week itching to get back out there and rectify things. "It has given us a new fire in the belly but there is pressure on us to perform in this one." Both Australia and New Zealand are expecting to continue tinkering with combinations during the annual four-Test series as they work towards finalising Commonwealth Games squad. Australia must address issues in the midcourt, exposed during the Quad Series they lost for the first time courtesy of the New Zealand drubbing, while testing out new and proven shooting combinations. "We will need to bring our smarts, sharp skills and our true Australian grit to the opening test," Alexander said. "We have done a lot of analysis and know what we need to work on in order to put out a game we can be proud of. "You'll see plenty of different combinations across the court, which will be critical in the lead up to next April's Commonwealth Games. "Think of it as a bit of a chess game, from both teams."